Fredy and Kaila have such adventure spirits, it only made sense that we did their engagement session at the second highest peak in the Shenandoah Valley on Skyline Drive! We met outside the entrance of Skyline Drive to ride together so we could stop at various lookouts all the way to the Stony Man trail. Let me tell you – it was TOTALLY worth the 1 mile hike up. 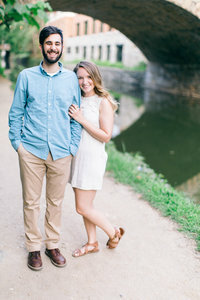 I can’t wait to celebrate with them on their wedding day in June! He proposed on the mountain where they had their second date: Dolly Sods in WV. It was really late October, so it was the last weekend that the foliage was worth seeing before the leaves fell. It was raining in Ashburn when they left, but they decided that even in the rain it would be worth it because it was the LAST WEEKEND OF FALL. Well, when they got to the mountain, lo and behold the rain had completely turned to SNOW due to the elevation. The fall colors against the blanket of white snow was absolutely breathtaking. At a particularly scenic bend in the road, Fredy announced that it was a great opportunity to take a picture of the two of them (“for a keepsake” he said) so Kaila, oblivious to his plan, said of course! He sneakily had her set up the camera on timer, and as she was getting ready to smile for the picture, he got down on his knee and popped the question! They are mostly excited about seeing all of their favorite people gathered together in one place. They’re excited for the huge step they are taking together, and their awesome wedding cake flavors!